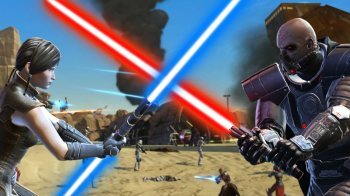 BioWare will fling open the doors to its Star Wars MMO on November 15. We've known for awhile now that this was going to happen, but now we finally know when: November 15 is the day that BioWare takes its last, best shot at turning the around the troubled Star Wars: The Old Republic. The free-to-play launch will take place in all regions where the game is available, allowing all players to advance to level 50 at zero cost. Those who do subscribe will still enjoy benefits, however, including complimentary "Cartel Coins" and preferred status, which eliminates or "greatly reduces" many of the restrictions of free-to-play accounts. Paying players will also have two extra quick slot bars, a purchasable Cargo Hold tab and can access the same experience boosts as free-to-play players, letting them advance at an accelerated pace. Former players who reactivate their subscriptions by midnight on December 20 will also be given free Cartel Coins based on the number of months they maintained a paid subscription prior to November 15. To find out more about BioWare's free-to-play plan for Star Wars: The Old Republic, hit up swtor.com/free.